I know it is the ultimate privilege to be able to say this, but travel can be stressful. And that’s why you need to incorporate days to slow the eff down when you’re living a life of frequent traveling. Lucky me, I was able to do this slowdown in the cute, quaint little city of Trebinje, Bosnia – a town of 30,000 people with virtually no foreign tourism, for now. 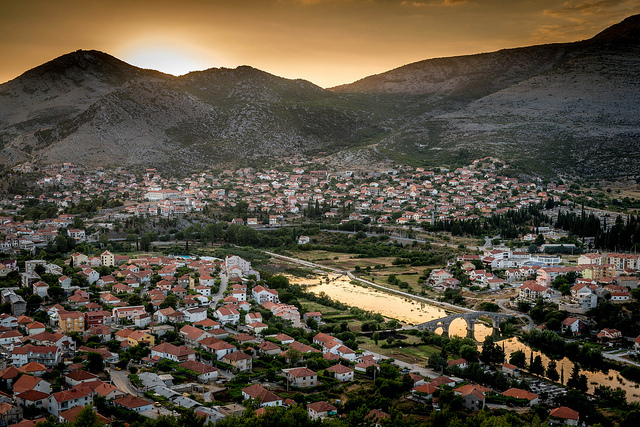 Yet for such a small town, Trebinje truly has the best of Bosnia, all in one tiny package. While there aren’t that many things to do in Trebinje, it’s the perfect place to embrace the good life and live a little slower – if only for a time. 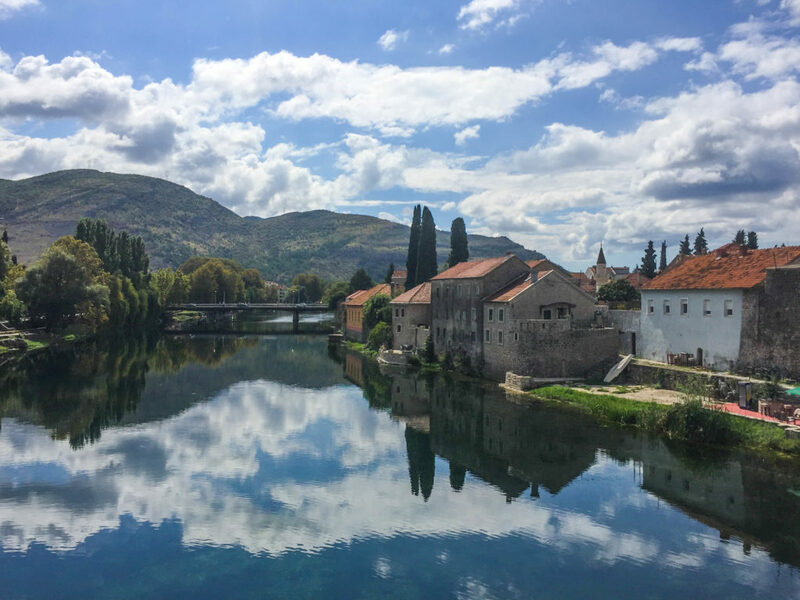 I spent 4 days in Trebinje and found it perfect for my laid-back travel style; however, if you’re just hoping for a quick visit, I’d say you can happily see most of the highlights in two. I wouldn’t try to give it just a day, though — the city is worth way more than just a blitz-style stopover. The river that goes through Trebinje, the Trebišnjica, is stunningly beautiful. This is the perfect place for a walk even on hot summer days, as the river breeze is nice and cool. As you walk, admire the glassy beauty of the water. The river is more still than many in the area, making it perfect for photographs. Just look at how perfectly it mirrors the buildings on the other side of the river bank — swoon. I’ve never seen mountains quite like Bosnia’s. Vaguely Martian in their undulations, they’re somehow both barren and supple. It’s the perfect landscape to fix your eyes on. While I was fully in relaxation mode in Trebinje and I never got up to much physical activity, there are several hills perfect brisk day hike, just on the outskirts of the city. I’d imagine that the views are stunning! Trebinje has what is likely the least busy, least touristy Old Town in all of the Balkans, which is in itself almost enough of a reason to visit this historic town. The Old Town was built by Ottomans in the 18th century and is remarkably intact. It’s lovely to walk through, not least because virtually no one will harass you. There are a few restaurants and shops, but the prices aren’t nearly as inflated as you’ll find in other old towns — I’m looking at you, Dubrovnik — and it’s actually enjoyable to spend some time there. This market is open daily in the mornings but is best on Saturdays. You can get everything from the freshest organic produce to local honey to home-cured prosciutto to a variety of handmade cheeses. Sadly, the cheeses are in danger of becoming extinct with impending EU regulations, should Bosnia be admitted to the EU. So go now and eat all the cheese. For science. Make sure you also buy the homemade ajvar (red pepper spread) and, if you’re daring, rakija (fruit-based “brandy” prepared in two-liter bottles). Don’t be afraid if they’re sold in old, recycled water bottles — that’s how you know you’re getting the real deal. 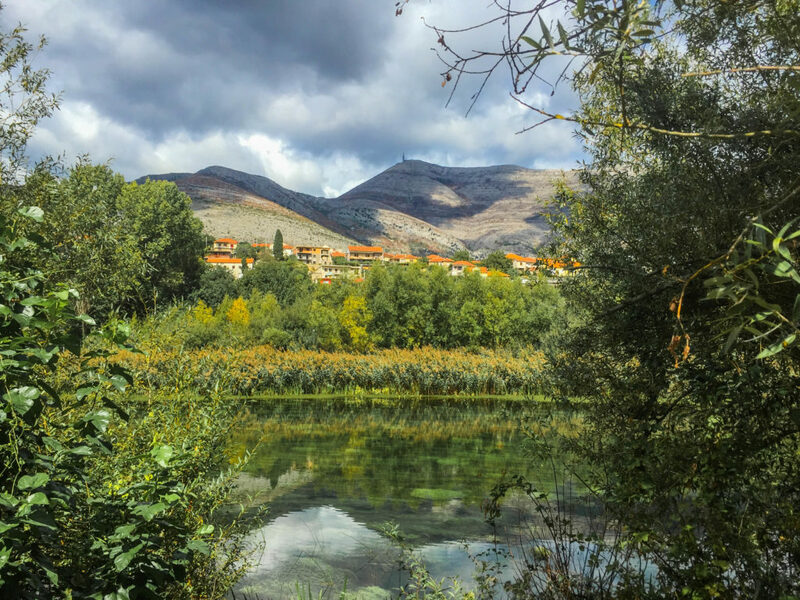 If you want even more of the landscapes, make sure you don’t miss the hiking in Trebinje. 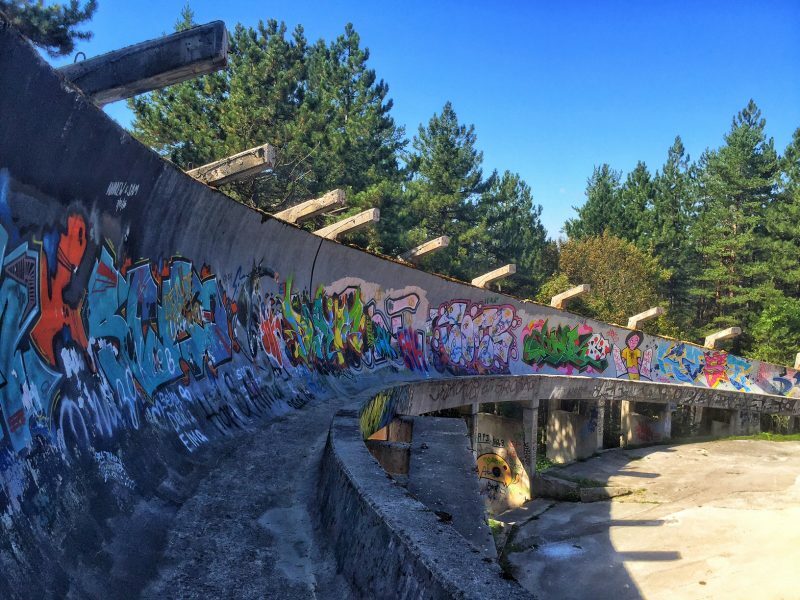 Trebinje is surrounded by seven hills, each with its own unique calling card, such as the abandoned Austro-Hungarian fortress on Fort Strač. The hikes are moderate, taking about an hour and a half or so to complete, requiring no special footwear. Be sure to stay on the path as Trebinje and Bosnia in general continues to have issues with stray landmines. 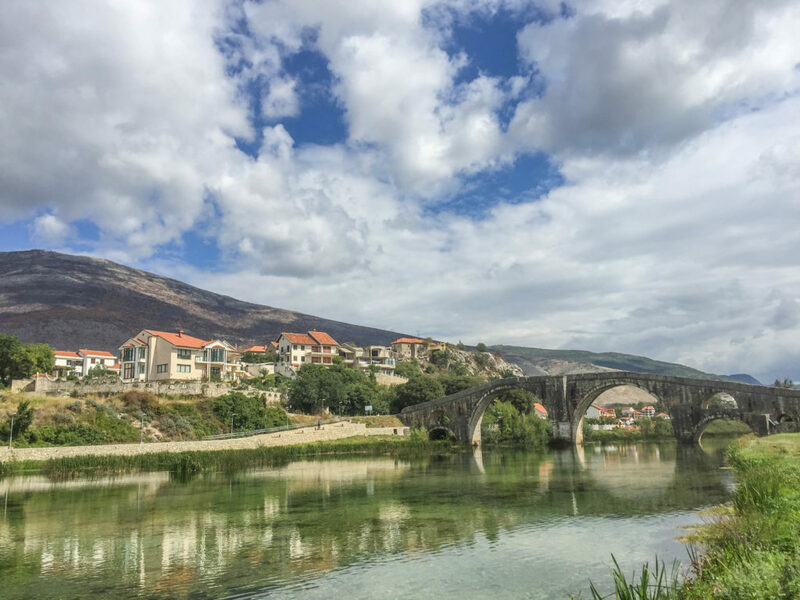 The Arslanagić bridge is one of Bosnia’s most beautiful – and this is a country that knows its bridges (have you seen the Old Bridge of Mostar? — stunning). Complete with two large arches and four smaller ones, its unique design is characteristic of its former Ottoman influences. What’s better, because Trebinje is not that touristy yet, it’s easy to get a photo of the bridge without any people on it virtually any time of day! Seeing the Herzegovacka Gracanica monastery gave me a serious sense of deja vu because it’s a replica of the Gracanica monastery in Kosovo, which I had seen when visiting Prishtina. 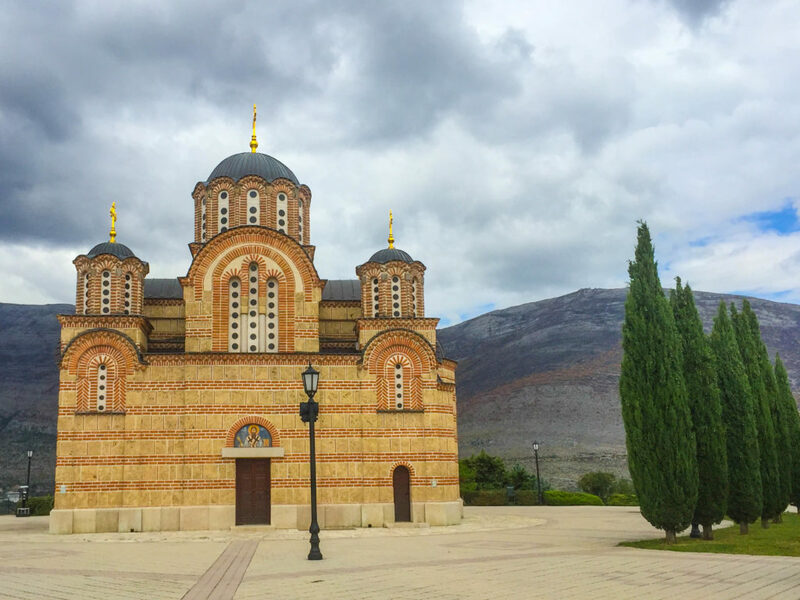 Done in the Serbian Orthodox style, this monastery is definitely worth a visit, as it’s unlike most other religious buildings you’ll see in Bosnia, which will largely be mosques. But because Trebinje, Bosnia is part of Republika Srpska, a semi-autonomous entity within Bosnia & Herzegovina, it is actually majority Serb – and hence majority Orthodox. Another thing you’ll notice is that all the street signs are in Serbian Cyrillic, which is something you won’t see in Mostar or Sarajevo! It’s a brief walk from the center of town, probably about 30 minutes depending on your pace, mostly uphill — so bring water if you’re hiking it in the summer, as Trebinje can get hot! About an hour before sunset, take a walk towards the Old Monastery with a few Sarajevsko beers (or a water bottle of rakija, no judgment, get your Balkan on) and watch the sunset in the beautiful hills that surround Trebinje. Definitely one of the best places to see the sunset in gorgeous Trebinje! 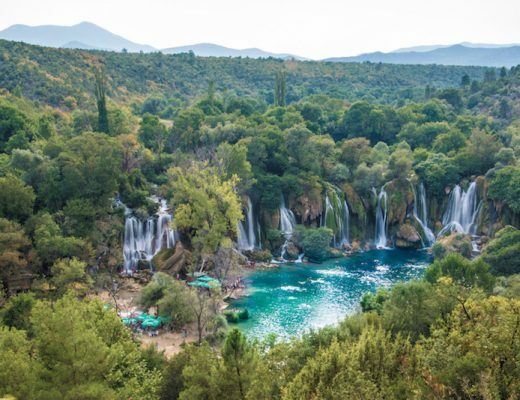 Did you know Herzegovina (the region that Trebinje falls under) is a famous agricultural region, particularly noted for its wine? Nope, me neither, at least until I got there!. There are lots of places just a few kilometers outside of Trebinje where you can do wine tasting at local wineries, though these usually require a small group and an appointment. Wine tasting is very cheap – usually about 10 marks (5 euros) including food! Or, if you’d like to sample some local wines at a restaurant, try Vukoje. It’s upscale by Bosnian standards but you still would be hard pressed to spend more than 10 or 15 euros per person. If you’re not going wine tasting but you want to seek out some local wines at the grocery store or restaurants; look for zilavka if you want white, and vranac if you want red. 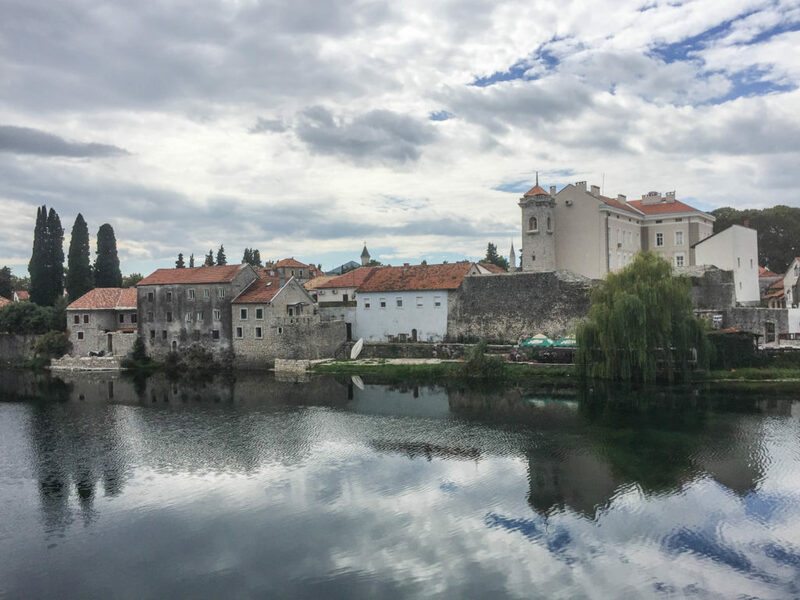 Most people tend to do this in reverse – visiting Trebinje as a day trip from Dubrovnik, mostly because it can be quite expensive to find a place to stay in Dubrovnik. Dubrovnik is a magical city and it’s definitely worth a visit if you have time during your time in Trebinje. 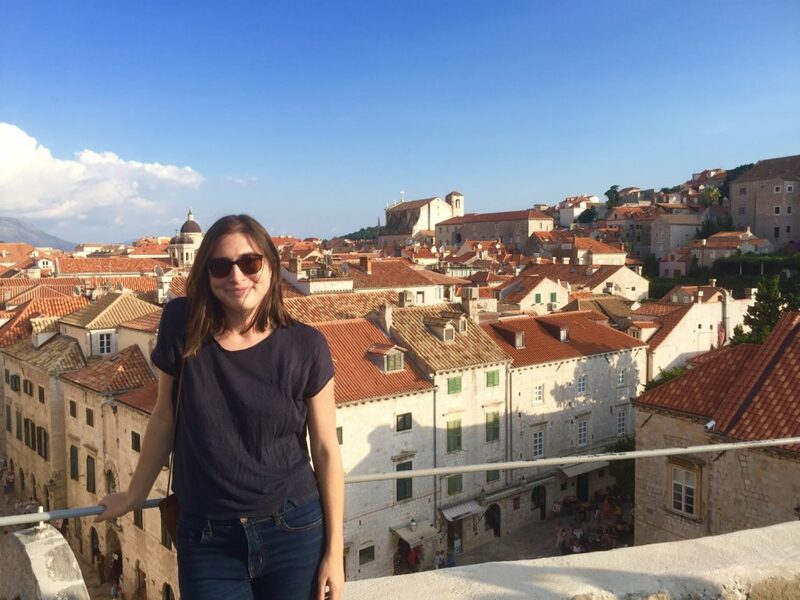 Go on a self-guided Game of Thrones tour, wander around the Old City Walls, eat a fresh seafood risotto at one of the many delicious restaurants in town, watch people swim in the Adriatic, or take a ferry to Mljet or one of the many small islands near Dubrovnik… there are countless ways to spend a day trip to Dubrovnik, in fact you may find yourself needing to spend at least a few nights there! Looks like a beautiful little town! I would love to get into the countryside of Bosnia more the next time we are in the area. I would too! Trebinje was a great teaser but there’s so many other little towns and natural scenery I didn’t get to explore. One summer I want to buy a cheap beater car and just road trip around the area! 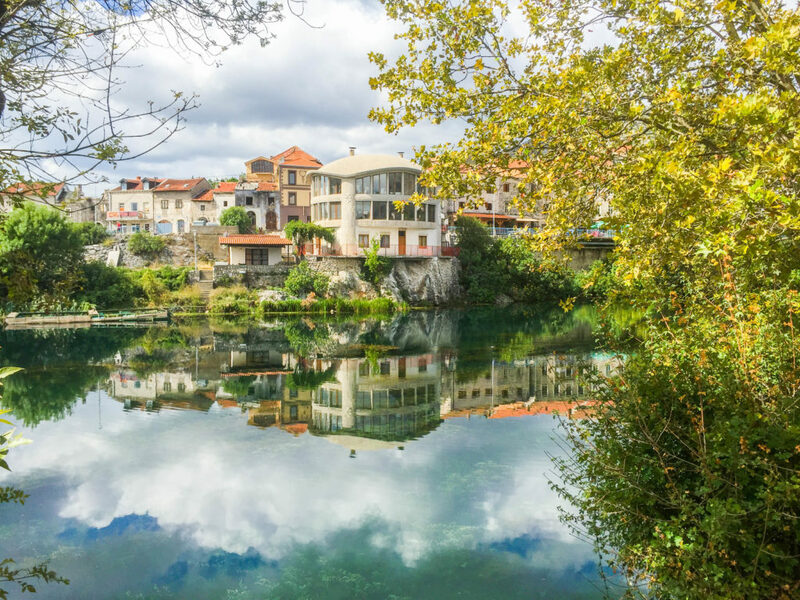 I have had no clue that anything like this existed there in a non-touristy fashion (reminds me of Mostar like you mentioned w/ its famous bridge… but there is no one there!) I definitely have a lot of Balkans exploration to still do and this is going on the list for sure! I love discovering off the beaten path places like this, they are so rewarding. Literally only met five other tourists my entire 4 days in Trebinje and it was only because we were sharing the same (and only) hostel in town 🙂 Mostar was shockingly crowded, especially after the peace and quiet of Trebinje, I think because of all the Dubrovnik day-trippers. Interestingly, Trebinje is only a 30 minute ride from Dubrovnik (in fact, I did the reverse and visited Dubrovnik on a day trip from Trebinje — the idea of spending more than 1 day in Croatia in peak season made my anxiety go through the roof) yet has no day trippers. I was debating heading to Trebinje, but ultimately ran out of time. It looks so lovely, and I’m regretting not finding the time to visit now. 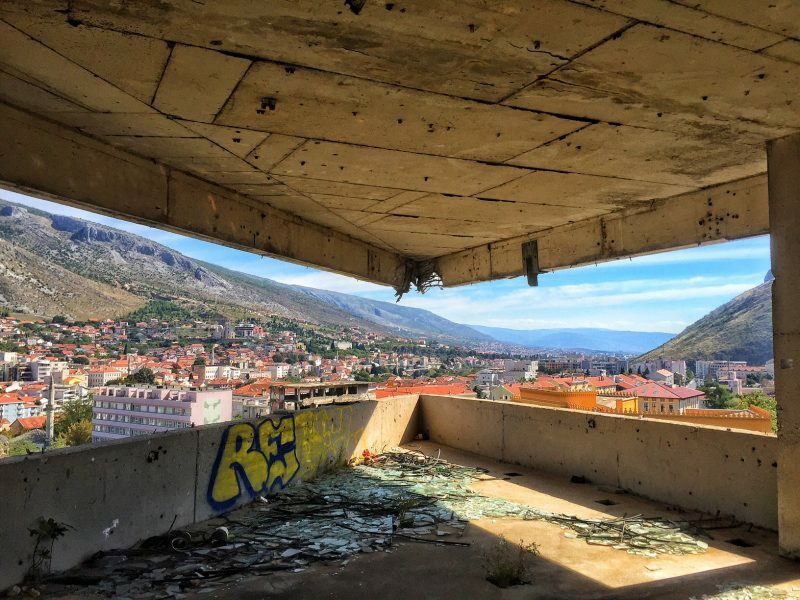 Bosnia is one of my all-time favourite countries, and I definitely want to see more of it. 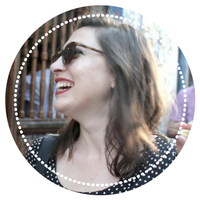 PS, I was also shocked at how packed Mostar was – really wasn’t expecting that.